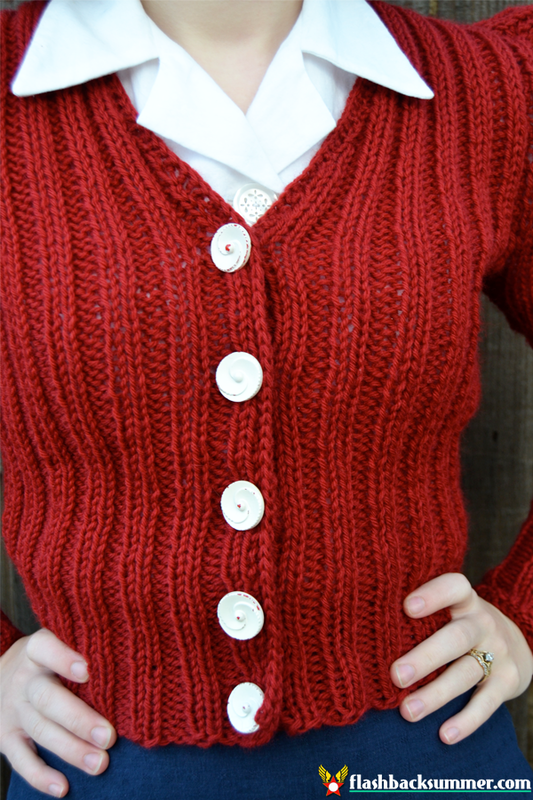 This is the first cardigan I have ever knitted, and I completely love it! It has so many features that make it a simple, quick knit. 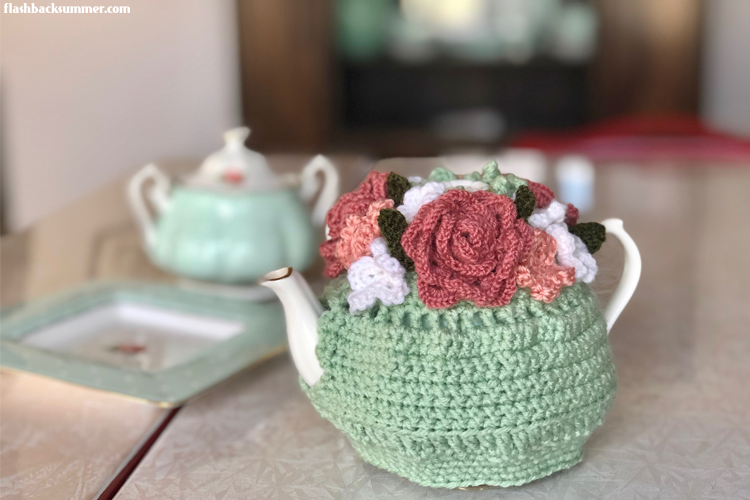 If one of your New Year's resolutions was to learn to knit, make more garments for yourself, or bust that ever-present stash, this would be a GREAT project for it. 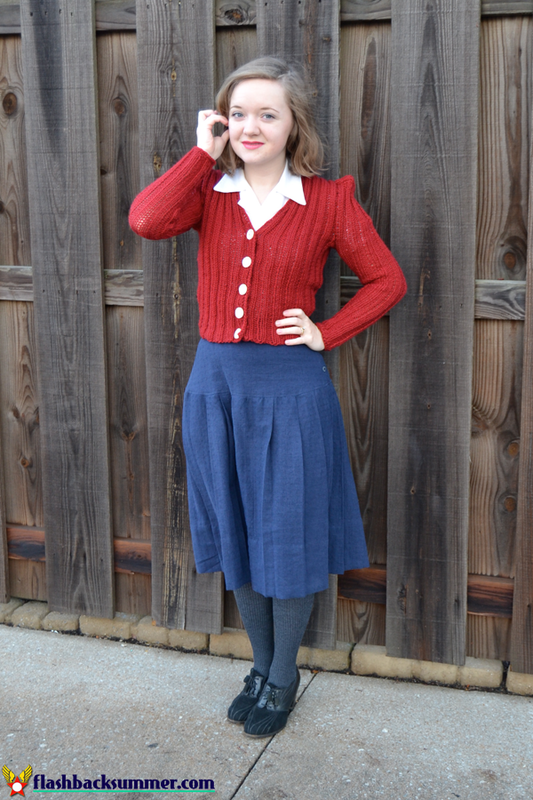 I got this 1940s sweater pattern at an Etsy shop that is on holiday until April, but after that you could get the pattern for yourself there at a very reasonable price. I wanted to focus on making buttonholes and box sleeves, since I had not done that in knitting before. 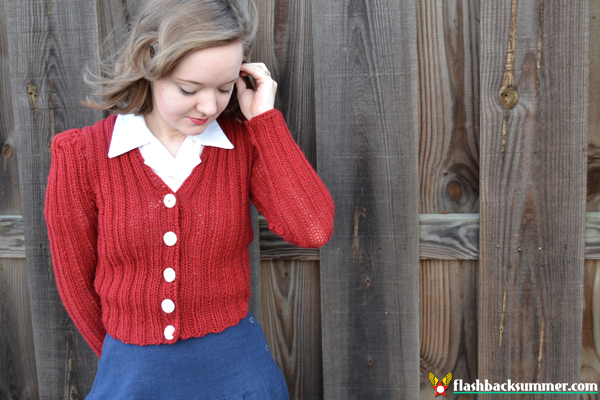 The simplicity of the rest of the cardigan was fantastic because I could use my brain power in those areas! There really isn't much to discuss about the sweater because it was very straightforward. 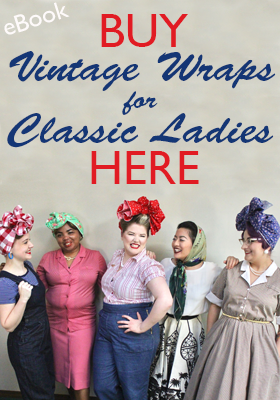 I HIGHLY recommend it for those new to knitting or vintage patterns. The whole thing is ribbed, and the pattern is easy to follow! There are more details on the construction below if you're interested. Pattern: Sun-Glo 40, No. 2292 "Undergrad"
How historically accurate is it? Very! I used vintage buttons and wool yarn. Any tricky parts to the pattern? Nope! Just be sure to buy buttons after you make the buttonholes to make sure they aren't too small, or buy larger buttons than you think you may need for that size buttonhole. 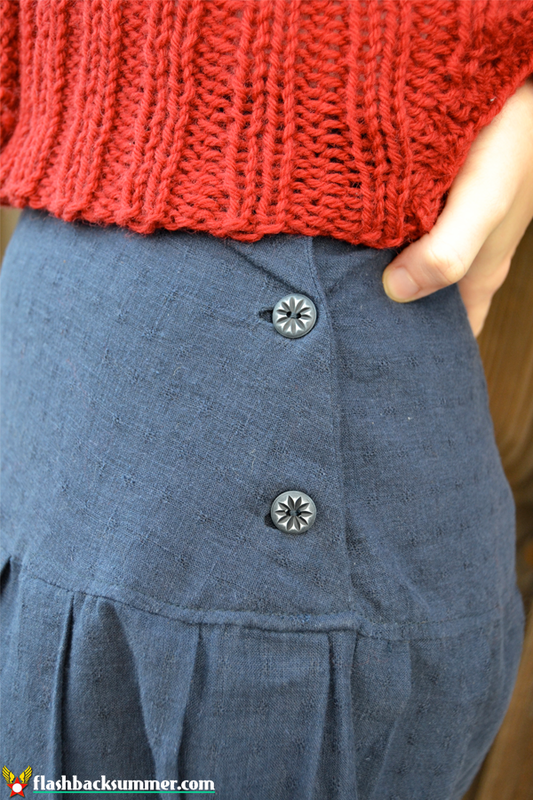 Knits stretch, so the buttons need to be larger in proportion than on non-stretch fabrics. Did you change anything? I made the sleeves a bit tighter and shorter for my petite self! Notes: I really like this pattern. 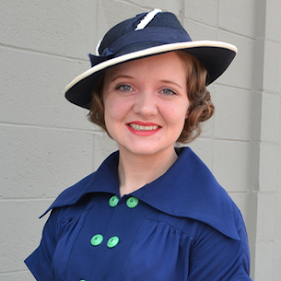 It has a fantastically 40s silhouette, and a short sleeve option is available, too. That's such a pretty color, Emileigh!! I love those buttons, they really make it pop! The sleeves look super fun as well, I'll be sure to check the shop out in April then! How cute! It's a perfect basic. What a cute outfit! 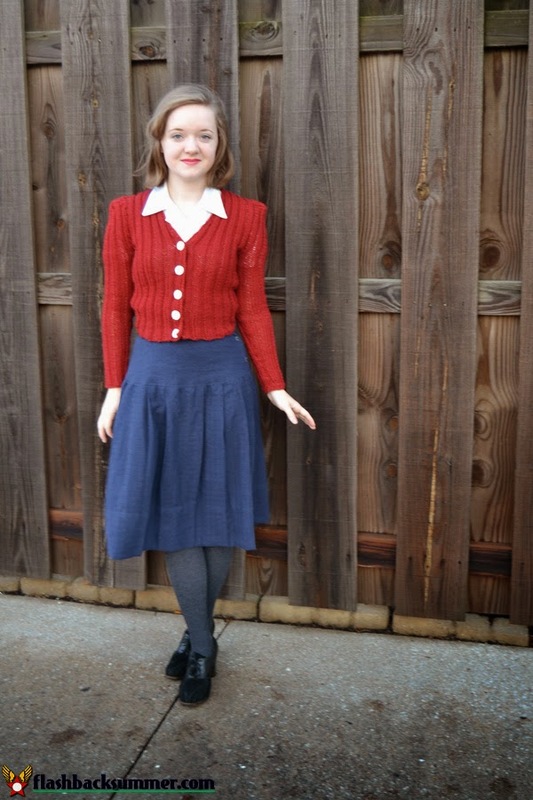 I love your cardigan and your color combination! How cool! The sweater looks great on you. 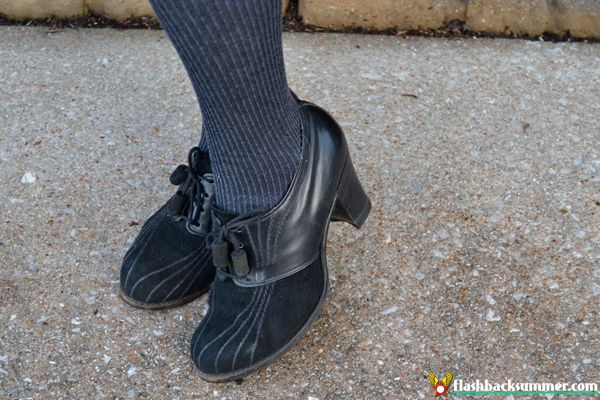 Your shoes are lovely! Cute outfit! What a lovely little cardigan. I'm so terrible at finishing projects. I really must get on and finish something I have started! Timelessly beautiful outfit. One can never, ever go wrong with navy (or another dark blue) and red together in my books. It's classic, patriotic (in some countries at least), and so becoming. That looks amazing! It's making me consider re-learning how to knit! It looks lovely. Those 1940's shoulders are interesting to knit aren't they?! I'm new to knitting and wondering how much do I need to decrease at front neck edge every 4th row? "Work to last 2sts, k.2 tog" -means that first 2sts are knitted normally without any tricks? I would be very happy if you could help! Smallest knitting needles I have found are 2.5. What size did you use? Best regards! Hey, I apologize, I didn't see your comments until now! I made this sweater a LONG time ago, but I believe the needle size I used was more around the 3.5 mm range (or bigger). I think I just converted the old needle size in the pattern to the modern needle size equivalent. Whatever you need to use to get the right tension! And as for the "Work to last 2sts, k.2 tog," I'm guessing this was on one of the front pieces? Then yes, you would only decrease at the end, just as the pattern says! If it says to knit two together at the beginning or on both ends, that would be the only time you would k2tog at both ends.